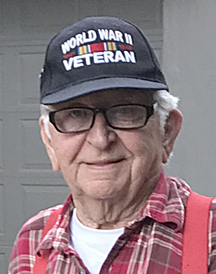 Marvin Toivo Perna was born on June 17, 1926 in rural New York Mills, MN and died peacefully at his home in Heinola on April 6, 2019. He was preceded in death by parents Toivo and Hulda Perna, wife Jlona, brothers and sisters Alvin, Morris, Vernon, Dennis, Jimmy, Vanette, Verla, and Vivian, son Allan, daughter-in-law Joann, grandchild Jaclyn, great grandchild Cody. He is survived by his sister Vida; children: Joni, Cary (JoAnn), Diane (Dan), Bonnie (Dan), Janel, Caroline (Kevin), and Rochel (Paul); 20 grandchildren; 12 great grandchildren, and 1 great-great grandchild. Dad was a decorated WWII hero who was honored to serve his country in Germany and received many medals of honor. He was a lifelong member of the New York Mills VFW. Dad’s wartime service has been commemorated in a video and is on display at the ITOW (In Their Own Words) Veterans Museum in Perham, MN. After returning from Germany, Dad married his wife of 59 years, had eight children, and supported his family working as a turkey farm manager, salesman, and most recently in the collection business where after he retired. Dad loved to travel with his wife and children, spend time with his family and friends, read, keep up on current events, meet new people, play cards, and had a great sense of humor. Since the death of his wife, Dad has lived independently in his beloved home. His family is deeply saddened beyond words and will miss his steady presence in their lives.